Two disconnected stories came across my screen yesterday so closely in time, I could not resist putting them together. See if you agree. Story One concerns the conservative advocacy organization, Americans for Prosperity, that is possibly the leading advocacy group in the nation fighting the Affordable Care Act/ObamaCare. Funded by the billionaire brothers, Charles and David Koch, AFP is perhaps the leading group in the nation fighting to prevent red states from expanding their Medicaid programs to poor uninsured people. On the other side are hospitals, physicians, insurance companies, business groups, consumers and just about everyone else except the conservative activists led by AFP and the Koch brothers’ money. “If there’s one thing that exasperates Tim Phillips, the president of the conservative advocacy group Americans for Prosperity, it’s when outsiders don’t understand he’s in it for the long run. “The group, founded by the billionaire industrialist brothers Charles and David Koch, has been around for 10 years already, and its presence is growing. Each time the number of people signed up to volunteer for AFP reaches a certain threshold in a state, AFP opens a field office there. It now has offices in 33 states, and at its national Defending the American Dream Summit on Friday and Saturday in Columbus, Ohio, Phillips joked that he was ready to accompany the handful of volunteers from Hawaii back home to do the difficult task of opening an office there. “In an interview Saturday, Phillips made it very clear: There’s no chance AFP is going to give up on its efforts to repeal President Barack Obama’s healthcare legislation, the Affordable Care Act. “Congress passed the healthcare legislation in 2010 and it took effect just under four years later. The Supreme Court has since ruled twice its provisions were constitutional in cases challenging it. The U.S. House of Representatives has voted many times to repeal it, but none of those efforts has made it all the way through Congress. Public opinion polls show a majority of Americans are in favor of keeping it, and Congressional Budget Office projections show it lowering government expenditures on healthcare in the future. But Phillips has a different perspective. “’The Left has been pushing for government-run healthcare since the 1920s,’ he said. He doesn’t think AFP’s struggle will have to last that long. This past week has been a tough one for Alaskans. On Tuesday, we learned that heavy rainfall had triggered six landslides in Sitka, and three men — beloved residents — were missing. The next morning, I headed to Sitka. The devastation was staggering. Family members and friends were on-site, hoping for a miracle and fearing the worst. I listened. I wished I could do more to ease their pain. I felt some of the same emotions when I visited several villages in the past few weeks. One community is on the verge of losing its school because so many young people are leaving their ancestral home for urban areas, where the cost of energy is lower. In another community, there is not a single flushing toilet. Our great state is facing some serious challenges. Meanwhile, members of the Legislative Council have chosen to sue me for accepting federal money to provide health care for low-income, working Alaskans. Since July 16 when I announced my intent to accept the money, not a day has gone by without someone approaching me to thank me or share a personal story. In Valdez, a doctor told me her patient will be able to receive treatment; she said Medicaid expansion will save her patient’s life. But there are others for whom the decision comes too late. Anchorage health care providers recently shared with me the individual stories of three Alaskans who did not have access to affordable health care. A 50-year-old man suffered for months with a toothache he could not afford to treat. The pain finally led him to an emergency room, where he learned the abscessed tooth had infected his brain. He underwent surgery, but it was too late. The procedure left him so debilitated he died two months later. A 60-year-old man suffered a stroke but refused to see a doctor because he didn’t have money or insurance. After his family insisted for six weeks that he seek medical attention, he finally went to the emergency room — only to suffer several more strokes that impaired his ability to talk and walk. He died three months later. An uninsured 23-year-old man with diabetes who did not have access to primary care was hospitalized three times with acute kidney failure before he died. My heart goes out to the grieving family members and friends of these Alaskans whose deaths could have been prevented with early diagnosis and treatment. This is not merely about policy. This is about people. I am accountable to these Alaskans. 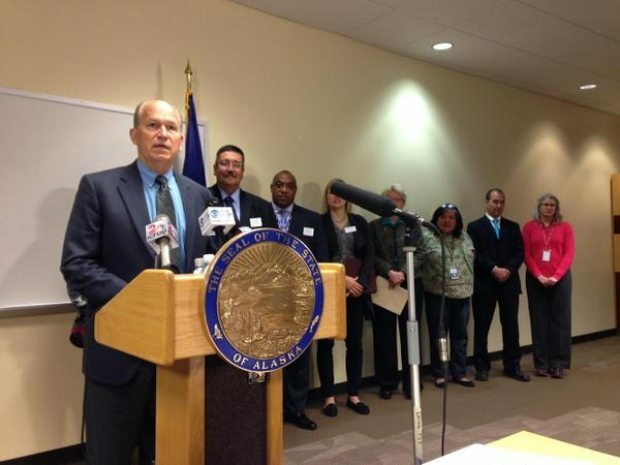 I am also accountable to the Alaskans who foot the bill for the uninsured. Providers at Central Peninsula Hospital in Kenai, Fairbanks Memorial Hospital and Alaska Regional Hospital tell me that health care coverage for one uninsured patient can cost a medical facility $1 million. They told me about the $226,000 bill incurred by an uninsured 36-year-old woman whose chronic pancreatitis led to nine emergency room visits and four hospitalizations. They told me about an uninsured 21-year-old man with acute kidney failure who made multiple trips to the hospital, including 13 emergency room visits in one year, six trips for dialysis and a two-month hospitalization. The bill topped $575,000. These are costs the rest of us shoulder. It just doesn’t make sense when we have an opportunity to bring home Alaska’s tax dollars to pay some of these bills. That’s what Medicaid expansion allows us to do. I am disappointed members of the Legislative Council chose to “defend the power of the purse” over the will and needs of the people. At a time when the state is facing a $3.5 billion deficit, 10 legislators chose to spend $450,000 to hire an outside law firm to block what more than 60 percent of Alaskans want; they chose to sue to prevent $145 million in federal dollars from being injected into our economy to provide lifesaving care for our fellow Alaskans. It’s unfair to paint all 60 legislators with a broad brush because of the actions of a few. I greatly appreciate the lawmakers who have voiced their support for Medicaid expansion and reform. It’s time we all work through our differences and pull together. It doesn’t make sense to waste money suing each other, especially when the budget is so tight we are laying off teachers, cutting troopers, and grounding search-and-rescue aircraft. I had the option on Dec. 1 to unilaterally expand Medicaid. But I wanted to work through the legislative process. I included federal Medicaid expansion dollars in my proposed budget; lawmakers removed it and asked that I introduce legislation. I introduced legislation. When lawmakers failed to take action during the legislative session, I put my Medicaid reform and expansion legislation on a special session call. Legislators again gaveled out without taking a floor vote, calling a new session without Medicaid on the agenda. Alaskans could not wait any longer. I used my executive authority. I don’t take that power lightly. I stand by my decision to expand Medicaid. I remain firm that it’s the responsible thing to do. It’s the right thing to do. We need to turn our attention now to Medicaid reform and redesign. We need to work together to ensure Medicaid remains an effective and affordable safety net over the long term. It’s time for collaboration, not litigation. Bill Walker was elected governor of Alaska as an independent in 2014. Bill Walker had zero to do with passing the Affordable Care Act into law. Prior to becoming governor, he was a local elected official and a lawyer for the gas industry. He looked at the Medicaid issue and lined up with common sense.